The Kidde 29H1ILL Optical Smoke Alarm has a sealed in 9v 5 year lithium cell to provide complete peace of mind. This optical smoke alarm is interconnectable with up to 11 other units to give complete fire safety coverage in a home. The battery is guaranteed for 5 years and the Kidde smoke alarm is approved to BS 5839 Part 6 2005 : Grade F.
The smoke alarm features a hush button combined with a stylish slim line design. With the sealed in lithium long life battery this is the perfect optical smoke alarm to protect the home. Optical Smoke detectors are designed to respond faster to smouldering fires such as those caused by cigarettes. Government & Fire Brigade statistics show that cigarettes are the major cause of smouldering fires in the home. With 36,500 home fires last year in the UK, studies proved that you were twice as likely to die in a home fire if you did not have working smoke detectors fitted. An optical smoke alarm is perfect for areas in the home where other alarms may be set off by accident due to activities such as cooking producing smoke. 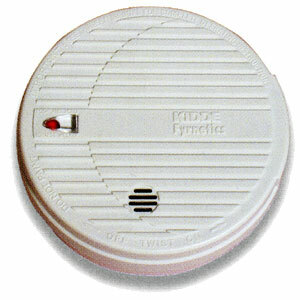 An optical smoke alarm is best positioned in hallways, landings, bedrooms, home offices and other living areas. Not recommended for living rooms if next to an open kitchen as they may be set off accidently. An ionisation alarm would be better suited here. An optical smoke alarm should not be placed in a kitchen or bathroom. REMEMBER TO CHECK YOUR ALARMS BATTERIES WEEKLY BY PRESSING THE TEST BUTTON ON THE ALARM. DUE TO THE SEALED IN LITHIUM BATTERY THERE IS NO NEED TO CHANGE THE BATTERY ANNUALLY LIKE YOU WOULD IN A STANDARD SMOKE ALARM. In the event of a fire, if in doubt, get out and call the fire brigade on 999. Your priority should be the safe evacuation of yourself and other people in the home. Do not try and recover household items in the event of a fire. For more information on home fire safety visit the Governments Fire Kills Website. Freight charges for Europe and Worldwide are dependent upon consignment size, weight and destination. Please contact us directly for quotes.